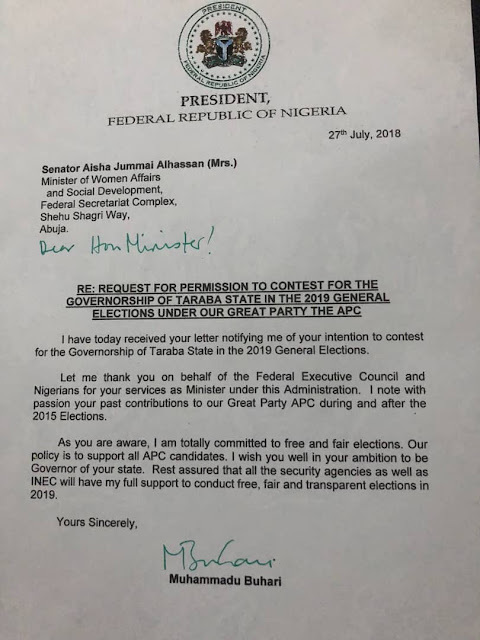 I have today received your letter notifying me of your intention to contest for the governorshp of taraba state in the 2019 general election. Let me thank you on behalf of the federal executive council and Nigerian for your services as minister under this administration. I note with passion your past contribution to our great party APC during and after the 2015 elections. As you are aware am totally committed to free and fair elections. Our policy is to support all APC candidates. I wish you well in your ambition to be governor of your state. Rest assured all the security agencies as well as INEC will have my full support to conduct free, fair and transparent elections in 2019.